Some anglers are a little disappointed, as there's new restrictions this year on both size of halibut (126cm) and on yearly maximum (6). However, it is good to have some certainty on when we can start fishing again for these great fish, and if this extends the season a little, that's good too. An odd part of the announcement is that season opens March 15th, but the size limit doesn't start until April 1st. 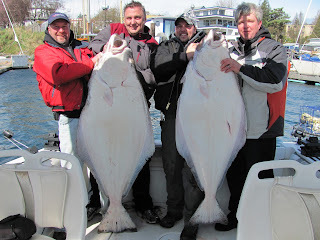 So, those looking for a trophy halibut, looks like you have a couple of weeks' window to chase them! Victoria and Sooke deliver a few biggies every year, so see you out on the local waters soon. Good luck out there -- and fish safe. a reduction of approximately 58 percent. recreational fishery allocation is 1.080 million pounds. the main SFAB meetings Feb 2-3, 2013.
they met the overall fishery objectives. in effect until 23:59 hours March 31, 2013.
vendors as soon as possible for the new licence year. which only one may be greater than 83cm. - The maximum length for halibut is 126cm. - There will be an annual limit of six (6) halibut (per licence holder). halibut is caught and its length shall immediately be recorded on license. management Areas 121, 23 and 123." Variation Orders 2013-79 and 2013-80. 627-3409 or Neil Davis 604-666-9033.